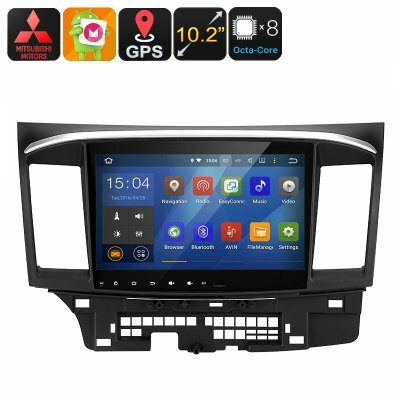 Successfully Added 2 DIN Car Stereo Mitsubishi Lancer - Android 8.0.1, Octa-Core CPU, 4+32GB, GPS, 10.2-Inch Display, Wi-Fi, Google Play, Bluetooth to your Shopping Cart. In-dash car stereo is molded to fit perfectly the Mitsubishi Lancer 2007 to 2016 models. Unhappy with your stock Lancer car stereo? Buy this state of the art in-dash car stereo and empower your car with the best that Android has to offer. Featuring a 10.2-inch display that boasts 1024x600 resolutions it delivers a stunning quality that is second to none. This double DIN stereo is powered by an Octa-Core Rockchip CPU, 2GB of RAM, and a PowerVR GPU so it will run pretty much anything you could need without even the hint of lag. Thanks to wireless network support so you can connect to a Wi-Fi hotspot or with a 3G dongle (not included) you'll be tablet or surf the web, stream media, and download apps from the play store all while on the road. 32GB of onboard memory that can be doubled via a micro SD card means there is enough for thousands of songs, tons of movies and even games to keep everyone entertained. There are also 2 video output ports so you can easily hook up additional monitors for your rear seat passengers. So whether it's the school run or the holiday traffic the kids will be looking forward to every journey because with games, cartoons, movies and more they'll be entertained all the way. Equipped with GPS module and having support for Android maps puts state of the art navigation into your Mitsubishi Lancer. The advanced tracking is pinpoint accurate and you'll be able to view your position on a 3D map. With voice navigation, you can keep your eyes on the road while this car navigation system guides you to your destination. This double DIN stereo has Bluetooth support allowing you to pair your phone for hands-free call answering. You will also be able to sync your contacts and with caller ID you'll know exactly who is calling you. AM and FM radio functions let you tune into your favorite stations or you can share music via USB port, Micro SD card or Bluetooth. If you have a rear view camera, car DVR or parking camera with video output you can plug it directly into this car media player and enjoy easier parking and a clearer view on the 10.2-inch display. With all these features and more this is 2Din car stereo is the best aftermarket upgrade for your Mitsubishi Lancer and comes with 12 months warranty, brought to you by the leader in electronic devices as well as wholesale car stereos and media players..